Cattle has been flown into Qatar to boost milk supplies amid a blockade of the country led by Saudi Arabia. The 165 Holstein dairy cows arrived from Germany - the first of about 4,000 cattle due to be imported. Air, sea and land restrictions have caused turmoil in Qatar, which is dependent on imports to meet the basic needs of its 2.7 million residents. The Saudi-led bloc warned of new measures against Qatar after it rejected their demands. 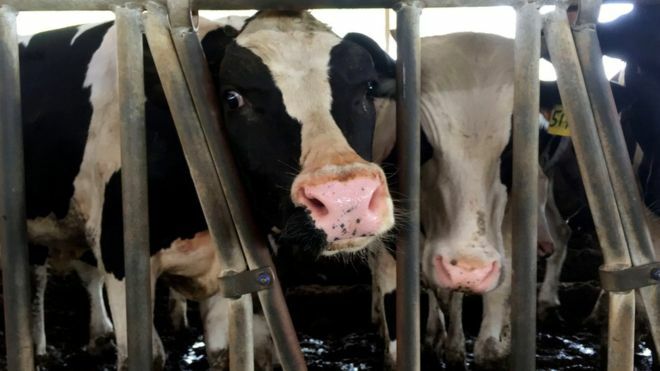 The cows arrived on a Qatar Airways cargo plane via Budapest on Tuesday and were taken to a new, purpose-built dairy. Qatari firm Power International has bought the cattle, with chairman Moutaz al-Khayyat telling Bloomberg last month that once all the cows were flown in, they would meet about 30% of the country's dairy needs. The products will be sold under a new dairy brand Mr al-Khayyat has launched. It has been five weeks since Saudi Arabia, Bahrain, Egypt and the United Arab Emirates began the boycott over Qatar's alleged support of terrorism and ties with Iran. Qatar denies wrongdoing. Before the blockade, most of the dairy products sold in Qatar were imported across the land border with Saudi Arabia.